It was clear for DMEI-CML (Direcção Municipal Economia Inovação - Câmara Municipal de Lisboa), they knew that what existed didn’t reflect the real dimension and potential of Lisbon’s entrepreneurial ecosystem. New concepts were emerging and it was a matter of time before other players, who couldn’t fit the existent “space”, popped up at their doors. Besides that, they aimed for more... Well, we all did! Starting with a small but relevant detail, the word that described this particular ecosystem (ENTREPRENEURIAL) and that we try so hard to pronounce, needed a deep refresh. 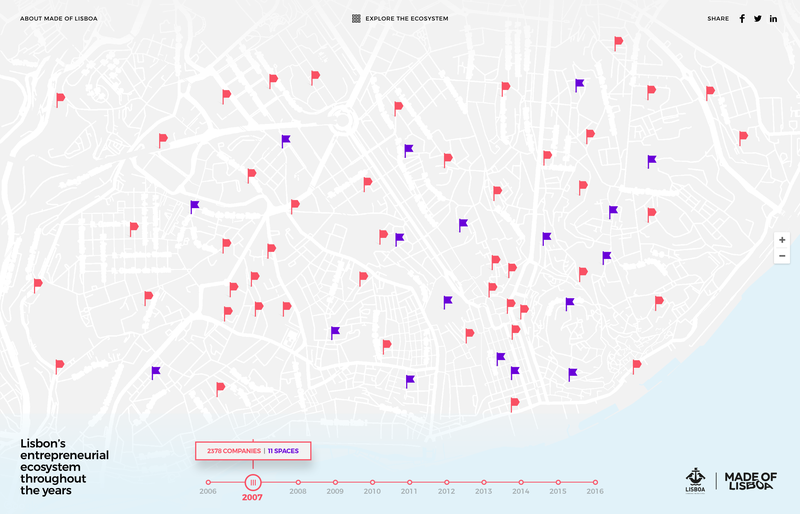 This special “space” (THE ECOSYSTEM) needed a real identity and useful digital tools that could be aligned with what the future was holding for the city of Lisboa. Why? To bring everyone together around the same purpose and to bloom the real power of an ecosystem. The new vision had to break up with the existent jargons and this endeavour had to be shocking enough to draw all the attention we could get. Lisbon is the new Berlin. Lisbon is the next Silicon Valley. What?! Lisbon is the next this, the new that... everybody was clapping and cheering up with this! Everybody was comparing Lisbon to all this brilliant cities so, therefore, we decided to do the same in order to provoke Lisbon... to Define Lisboa. We brought this statement into the spotlight but in an ironic sense adding some funny and very intentional answers to each statement that each person should pick and contribute with a thought. “Lisbon is the new Berlin… And I’m Santa Claus // Ya Proust”... Lisbon is the next Silicon Valley… We got potential // Never”... Lisbon is... Lisbon is the new Lisbon! We knew that for sure. And we went on a long journey to define this new Lisboa. From the very beginning we were aware that this was about the city and it’s people. So, how could we explore, co-create and bring this mix of different people down to a common ground, all at the same time, to build their own self definition and expression? How could we create a place where startups, investors, startup workers, foreigners, big and small companies, students, outsiders or entrepreneurs, could identify themselves together in an inclusive way? Define Lisboa was the expression of a Human-Centered-City process that made this possible. We had seven months of hard work. 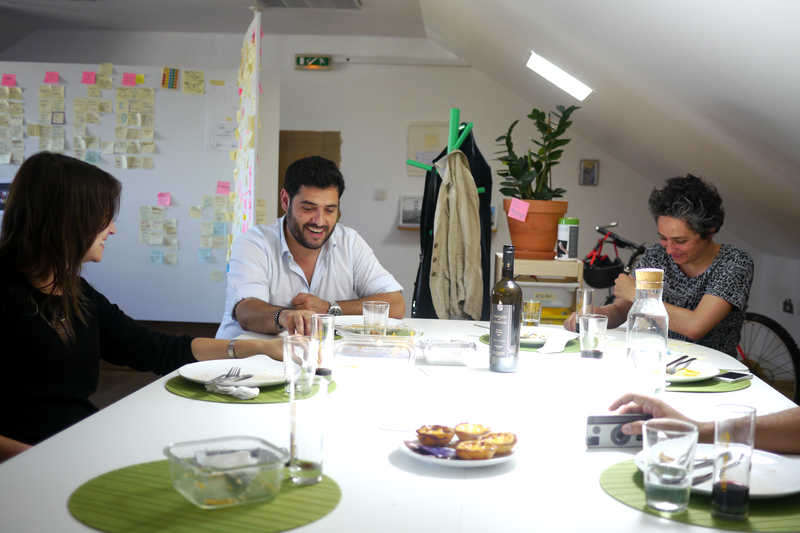 We interviewed more than 60 people (from inside and outside the ecosystem, from Portugal and outside Portugal). We visited more than 15 different places where we did field observations and some immersive experiences (what is it to work in a cowork space or how is it to be part of such an environment?). 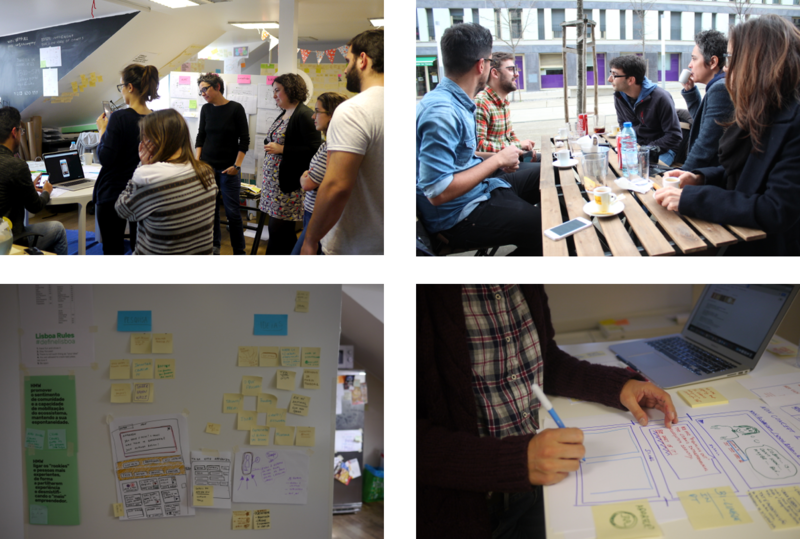 We also had a 12 hours Super Sprint session bringing fresh minds into the process. Ideation, iteration, clustering and prototyping sessions took place and hours of desk research, 2 surveys and statistical analysis, co-creation workshops with the community. In the end, we used more than 20 different methodologies and more than 30 different tools and resources (here you have them for your own delight - kickoff tool, mindnode, Excel, Google Drive, Google Docs, Google Trends, Google Calendar, Typeform, Slack, Adobe Illustrator, Word Cloud Generator, Wordpress, Facebook, Twitter, Snapchat, Instagram, Behance, Vimeo, Stakeholders Map, Journey Map, Benchmarking Tools, Users Experience, Personas, Github Atom, Ampps, Adobe Photoshop, Sketch, Transmit, Balsamiq...). We were on a quest, on a living journey. We assumed that this was a longitudinal process to define the broad identity of a bright, vibrant and diverse ecosystem. Researching, co-creating and prototyping almost at the same time, checking and rechecking, confirming and rejecting assumptions that already existed or emerged from the ecosystem itself. 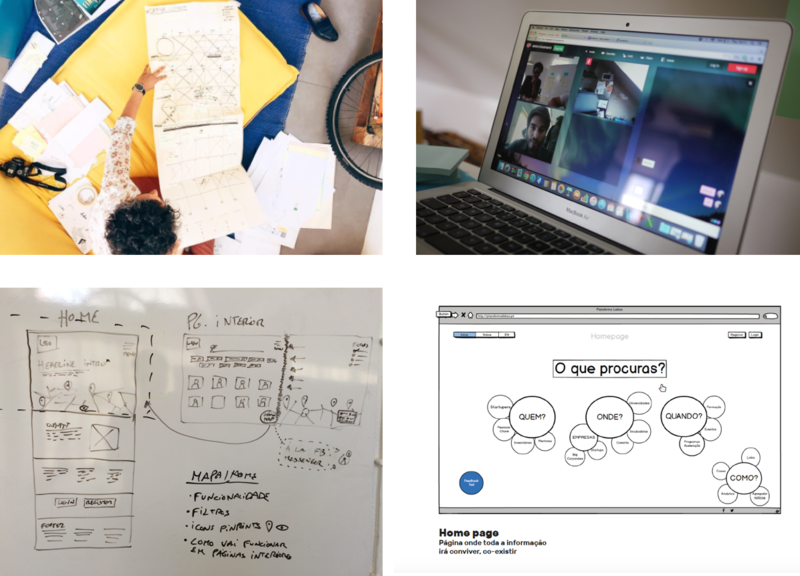 Yes, we needed many different tools and methodologies to capture all this and we even created new ones, tailored to the community. We had to create our own digital tool to collect data on a faster, different, democratic, funny, longitudinal and co-creative way (we had more than 1000 valid answers through this tool). Since this was an ongoing process we needed a constant validation from the community to some of the existent assumptions and premises. Almost in real time, we had information from the ecosystem, that helped us to choose the better options, features, colours, shapes, moods, voices, names… more than 10 campaigns were part of this digital tool. On the other hand, this was the way that we found to better communicate our needs and questions with the community and also, to bring awareness on this collaborative process. This had to be made with everyone because this was meant to be to everyone that felt that was part of this community. This integrative digital tool was a dynamic piece of an integrative movement. Let’s bring Spotify to Lisbon… shall we? Trying to know what was happening in Lisbon and around the entrepreneurial world was a constant focus, a constant search. After lot’s of reading hours we stumbled on a special news: “Spotify co-founders threaten to move out of Sweden”. The bells rang! We’ve heard something similar before with the movement created around Web Summit 2016: “Let’s bring the Web Summit 2016 to Lisbon” and about the amazing impact that it had! So we launched on our digital tool: “Lisbon is the next home for Spotify” with a peculiar portuguese music on the background (Rancho Folclórico). We wanted to make a blast and spam Spotify in a huge way to get their attention. The buzz was inevitable! Thousands of visualizations, lot’s of retweets and shares and when we expected nothing more, something amazing happened, the community took the next step by creating the facebook group: "Let’s Bring Spotify to Lisbon". This was the first sign that our compass was showing us the right path, in order to involve the community. One of the things that we valued the most was that we should always be the closest we could to the community. 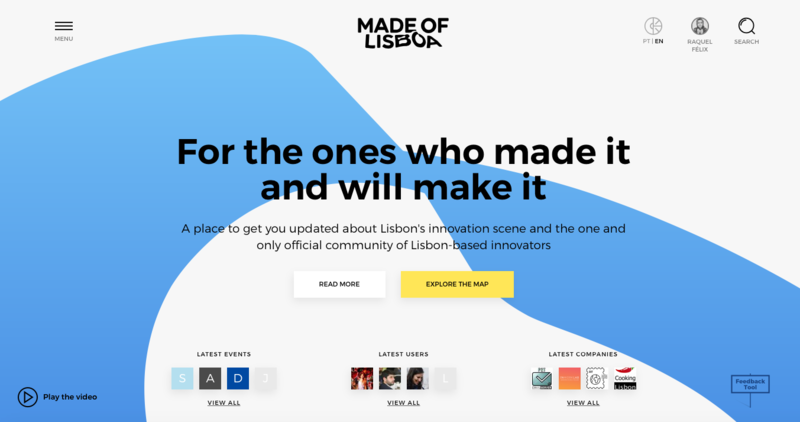 Every moment that we’ve created had that purpose, even a simple sentence like “Lisbon is... and you have 30 seconds to answer” that popped up in Define Lisboa digital tool for a few days. This were co-creation moments with the community with a digital basis. We’ve challenged Mariana Duarte Silva from Village Underground Lisboa, Miguel Fontes from Startup Lisboa and even the Vice-President of the Mayor’s Office, Duarte Cordeiro, to pitch for Lisboa but on film! And, once again, among the community, another movement rised up. 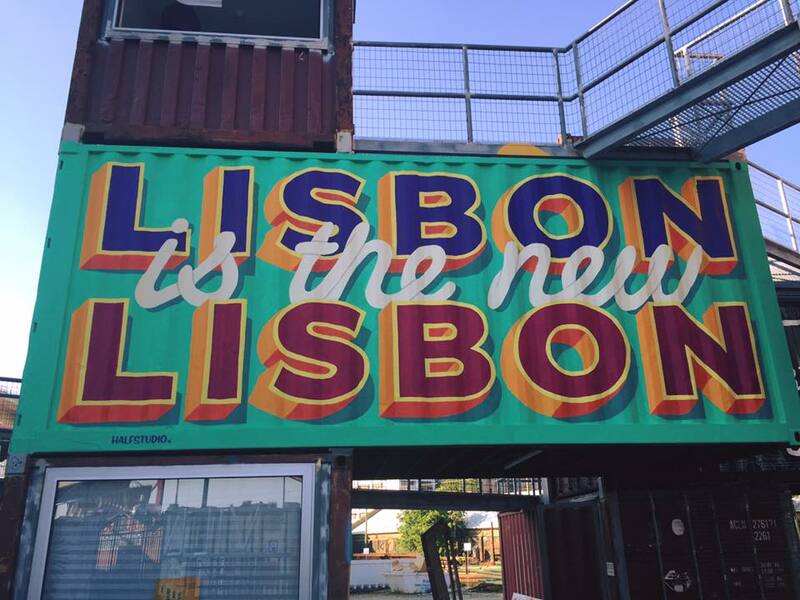 Mariana made it big by painting one of the containers at Village Underground Lisboa with the blasted sentence: “Lisbon is the new Lisbon”. Simple as that! This was another checked and add it on moment! Yes, we wanted, we needed, we had to talk to Rohan Silva. Why? Because he could help us understand what we had between our hands. Besides, he was the guy behind Second Home (an hybrid concept that mixed startups, big companies, a coworking space, a library, talks... ) and he was the former senior policy advisor to David Cameron and special adviser to George Osborne. He was also the man behind the Tech City project in London that support the growth of the technology cluster in east London. So, yes! Rohan Silva please! His outside vision and knowledge were very important. But how could we get to this outstanding figure?! In our heads he was kind of an ET, an untouchable person with no time for a bunch of guys and gals defining Lisbon’s entrepreneurial ecosystem. Do you remember Mariana from Village Underground Lisboa? There’s another amazing thing about this community, when you less expect, someone helps you by sharing connections, by making possible bridges to what it seems to be impossible. Yes we did it again, we talked with Rohan Silva! People are indeed the real community connectors and that, definitely, should be represented on the brand and on the platform. We also had the “not so good moments” too. We even had some "haters" along the way (think of this has a metaphor). One “velho do Restelo”, questioning what we were doing, trying to find the dark sides of Define Lisboa. Nothing wrong with this approach because that’s a cool evidence, to show that we were actually changing things and that, maybe, there were more point of views to include. This is a necessary part of the process because we can get things wrong sometimes too. To take away the shadows, the doubts and better understand what this person was trying to tell us, we invited him to have lunch with us. After a couple of hours the "hater" became the "lover" and now, he’s one of the most active guys in the community Made of Lisboa. To listen and not to judge, this is where you can get more information, more knowledge and more understandings of how a community should act. 9) An ecosystem made just for startups leaves out: big corporates, universities, makers, research centers, ordinary citizens (entrepreneurship is much broader than startups). 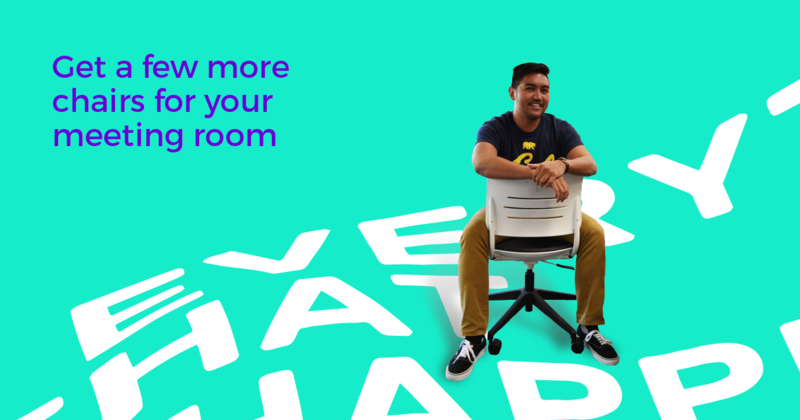 We gave the community a brand, a voice and a new digital “space”. Each one reflected the work and the findings during this long process, side by side with this prodigious community. This was going to be their new expression, their new home to live, to work and to welcome those who wanted to be part of it. The main axes? Past, present and future equals co-existence. The inhabitants, the innovators and the city itself equals a collaborative synergy. All together, coexisting and co-living in mutual respect with their minds looking upon the future. A place for visionary people that build businesses in a very Lisboeta way. The brand took off from the city hills (the metaphor again). The way it shapes us and how we shape the city was the motto for building the logo. Several prototypes were made until the final result came out. Even before that, the naming process itself took us to more than 300 different names. Made of Lisboa was the right choice, the proper allegory for this new Lisboa, where things take “of”, where business are made “of” everythings that involves this restless city. The article is an expression and a link, an extension and a reception of the city essence. We ended finding the right words and the right “place” for this community. Made of Lisboa, where the word Lisboa sits on three of the seven hills of the city (São Roque, São Jorge and São Vicente) and the letters undergo a slight deformation, resulting from the steep slope of the hills.This new Community of Lisbon-based innovators it was meant to be the link that connects the city and the ecosystem. It should be the reflection of an entrepreneurial mind in a city like Lisboa. The essence of the city + the innovative minds = brand identity. The city was always present, and the community validated that. The city, always the city. We would ask: “Why Lisboa and not some other place instead?”. They all would answer: “Because Lisboa it’s unique, and there’s a unique way of doing business over here!”. By its own characteristics, Lisbon is a unique place to work and live. The entrepreneurial ecosystem cannot live without the city itself. The brand, and it’s voice had to carry that. The diversity of spaces, people and businesses, is the perfect alliance between the city and its individuals because Lisboa is Made of People Made of Startups Made of Innovators Made of Pastéis de Nata Made of Seven Hills Made of Desenrascansos Made of diversity Made of Inclusion Made of Balance… so, its voice is Made of portuguese sayings mixed with good english (we speak good english! ), with an informal, inclusive and relaxing mood. Made of Lisboa had to had its own customized typography. It was drawn from Rubik. The city “handwriting” it’s ideal to be deformed and give the feeling of the hills and the idea of wandering. In the end, Made of Lisboa is colourful, iconic, expressive and is made of the city itself. And then, a 3D Digital Tool came out of this process, to help designers and community instigators to act in the name of this new brand and digital space. 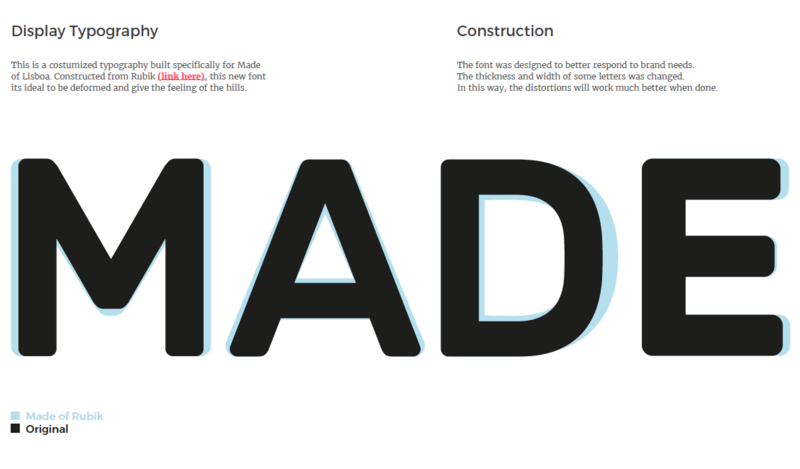 The awareness and the design of this tool started when we sensed the different layers, aspects and moods of this brand. It had to had a more physical expression. The mood that we draw, always got us to Lisbon’s toponymy, the perfect metaphor for an entrepreneurial life (the ups and downs of the hills, the ups and downs of a business). This was inevitable because it was necessary and differentiator. 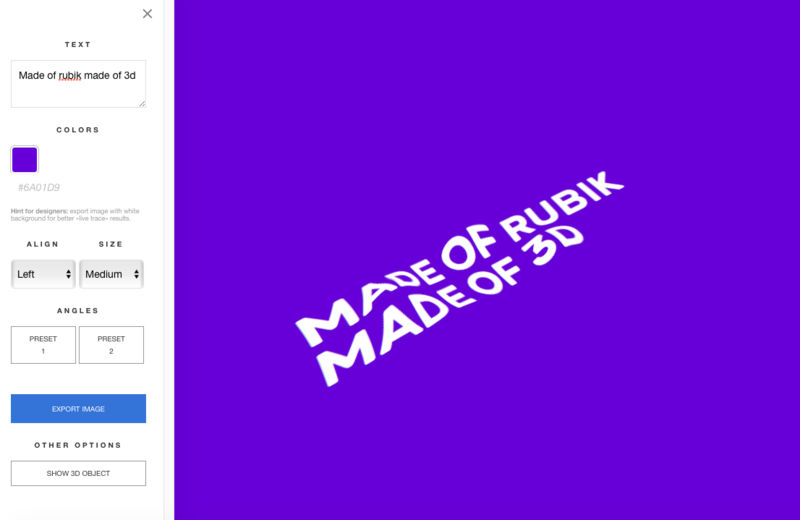 Creating a digital tool to generate a specific typography (Made of Rubik) and to bring Made of Lisboa expression into the spotlight. This is the common ground where everyone gets to know each other. The main purpose? To organize, attract, connect and inform the community, for those who are part of it, for those who want to be part of it, for those who want to invest, for those who are out and know nothing about it, for those who know it and like it and for those who live here because...There’s no ecosystem without the city itself. They both have to learn how to talk, coexist, communicate. 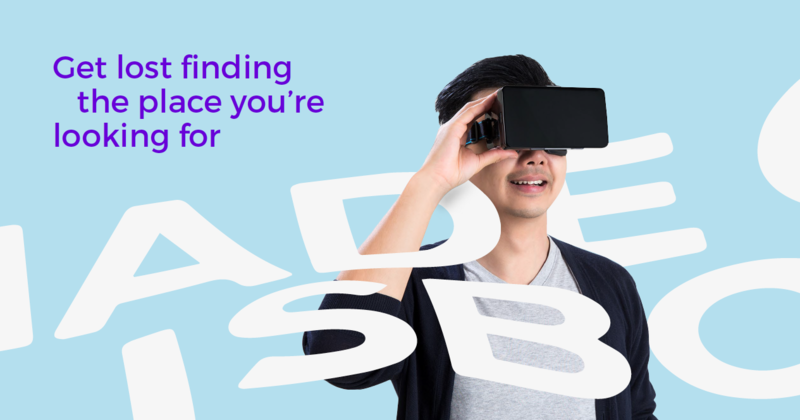 This new digital “space” aims to promote a balanced coexistence and the feeling of belonging in a unique community and make the innovation scene of this city grow. The players are visible to everybody. No hide and seek! You get to know them by name, by face, by actions and they have the tools/resources to act upon (events, companies, spots, news, resources, glossary, analytics, cases, tips and quotes). The different features are aligned with the city values and the best example of that, is the Best Practice Guide, that anyone in the community can build upon in a crowdsourced way. We made the platform participative and brightly visible, just like Lisboa. Resilient, flexible, ongoing, restless, forecasting, inclusive, broad and constantlly changing. Aware of the bridges that this “space” (digital and physical) will have to build, constantly, between old and new, insiders and outsiders, the unknown, the things that will come and that we don´t know what they are yet. That’s why Made of Lisboa will have to continue to evolve, to add more features and maybe to lose some of the existent ones. Time and the community itself, will have something to say about it, that's the point. Crowdsourcing and opensourcing… this will help the platform and the brand to catch up the new trends and the envisioning minds of this future community. It’s now up to the Mayor’s Office and to the community to embrace Made of Lisboa with an open mind. The new features that were collected, but not developed, might see the daylight in a near future. 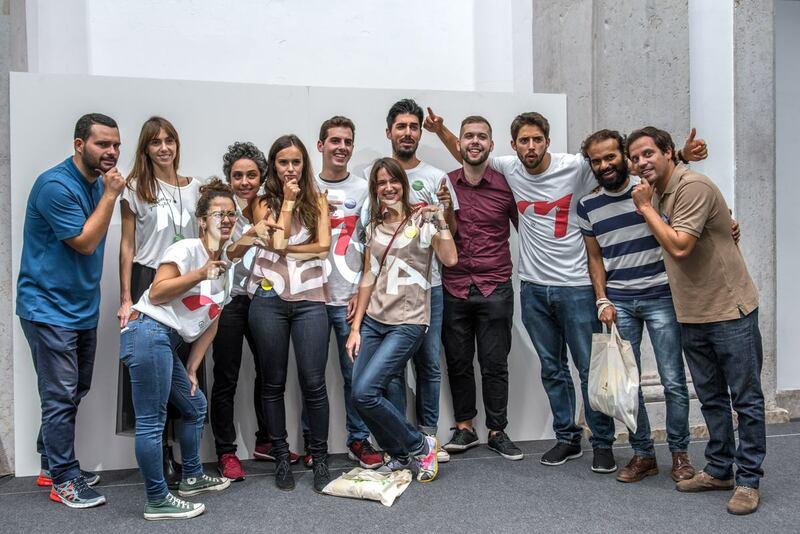 The community will grow and it will get different, just like the city, just like Made of Lisboa and to face that, Made of Lisboa should be Made of our own futures, always aligned with the community and the city. Lisboa. 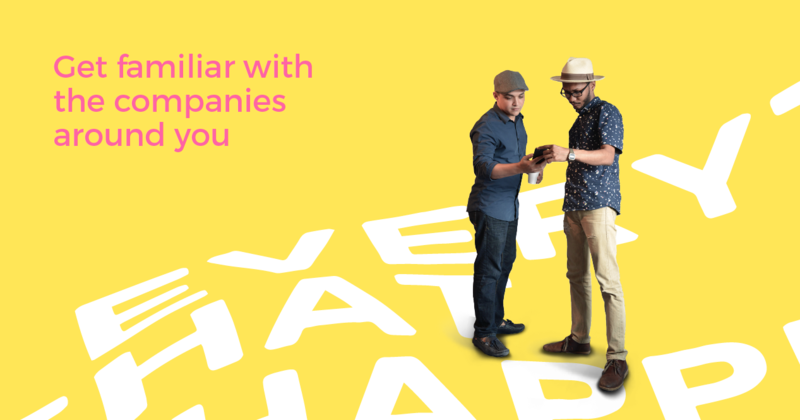 Check out more With Company cases here.